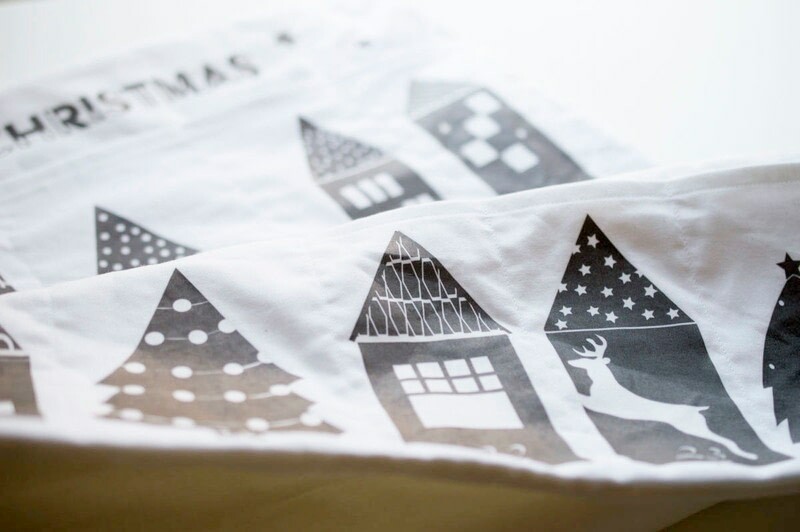 Make a one-of-a-kind advent calendar using transfer paper and this quirky, original design. This an advent calendar is out of ordinary and not just because of the circus-inspired design. It includes ‘activities’ for each day instead of a toy or piece of chocolate. The magic of Christmas is enhanced so much when we make an effort to spend time together and do things for others. Making it yourself will only make it more special. Using transfer paper and quilting cotton, this advent calendar creates 24 pockets that can hang on the wall. 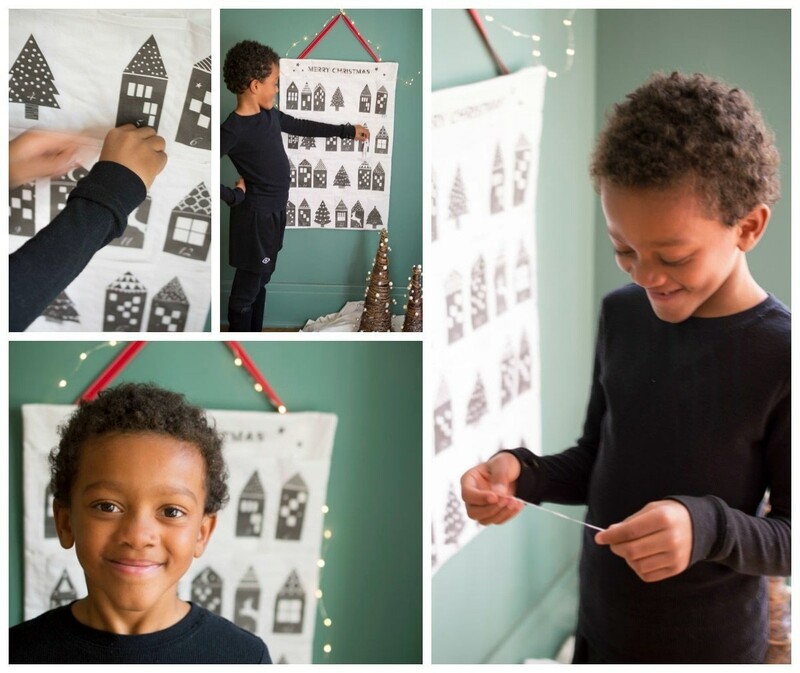 I designed each of the advent activities to encourage my family to spend time together, to reach out to neighbors or the community and to remind us how much we love each other. Best part is you can reuse it every year! Original design by Melissa Q. 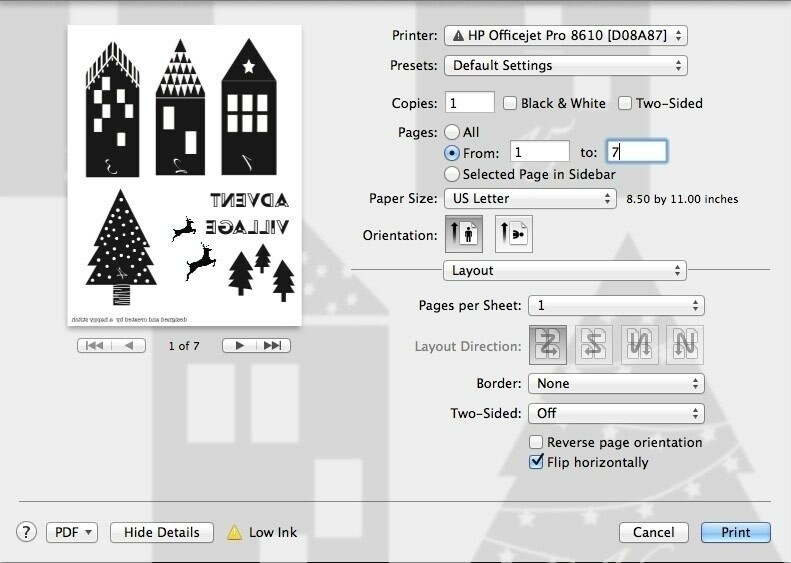 Open the advent-village PDF and print in two phases. First, print the first 7 pages of the document onto the FABRIC transfer paper (read the product instructions for how to best use this paper in your printer). BE SURE TO FLIP THE DOCUMENT HORIZONTALLY (see photo for example), this will ensure that when you iron on the images, the text and numbers will not appear backwards. Second, print the final page of the document (the activity slips) on card stock or standard paper. In this case, do not flip the document. Using an exacto knife or pair of scissors, clip closely around the edges of each printed image and the Merry Christmas banner (including any of the add-ons you would like for your banner). Cut from the white fabric the following pieces: 1 rectangle 4″ x 16″ for the back casing; 2 rectangles 30″ x 20″ for the base and backing; 4 rectangles 20″ x 7.5″ for the pocket pieces. Iron one of the long sides of the pocket pieces over 1/2″ and then another 1/2″ to create a hem. Stitch the hem closed. Repeat for the remaining 3 pocket pieces. Iron the bottom, long-side, on three of the pocket pieces up one 1/2″. Do not sew. Take the village images you have cut and carefully place them on the pocket pieces in numerical order from left to right placing six images across each pocket piece. Leave room on the left and right side for seam allowances. Be sure to place images #19-24 on the pocket piece that doesn’t have a bottom fold. Remember to place images #19-24 at least a 1/2″ from the bottom to account for seam allowances. Once they are arranged, evenly and spaced as you like best, flip the images over so you are looking at the paper backing. Following the fabric transfer paper instructions, IRON them in place. Take your time and go slow. It’s a little tedious but don’t skimp on this step. 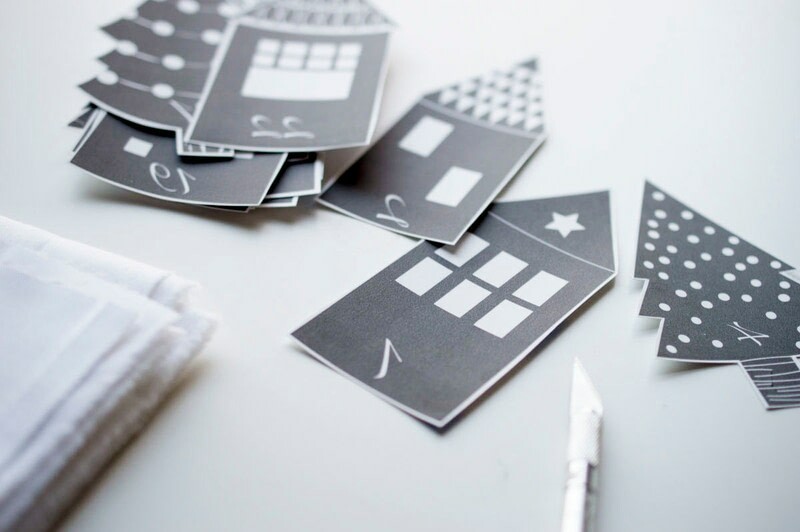 Once they are completely cooled, carefully peel off the transfer paper and admire your budding village! Arrange the Merry Christmas banner on the base fabric, centered and about 1 1/2″ down from the top edge of the 20″ side. Add any of the decorative add-ons you like. Iron in place just as you did with the village. 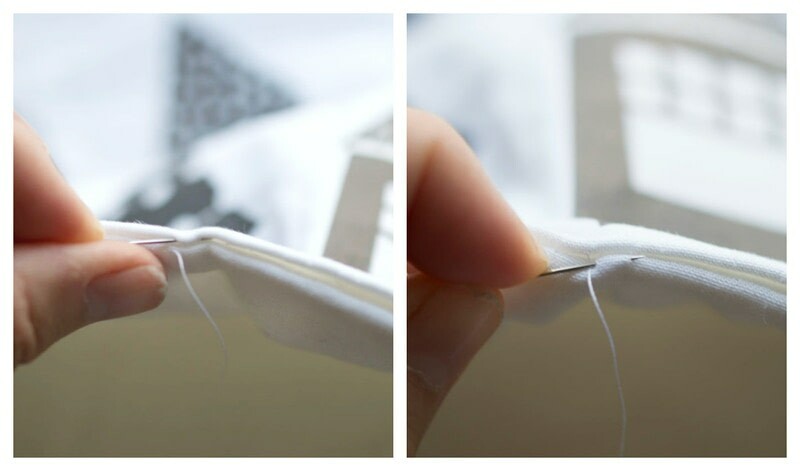 To sew the pockets in place, you will work from the bottom up. Start by placing the pocket with images #19-24 along the bottom edge and sides of the backing fabric and baste stitch the bottom and sides to hold it in place. Place the fold of the pocket with #13-18 one 1/2″ above the previous pocket. Pin in place and edge stitch along the bottom fold to secure in place. Repeat with remaining two pockets. 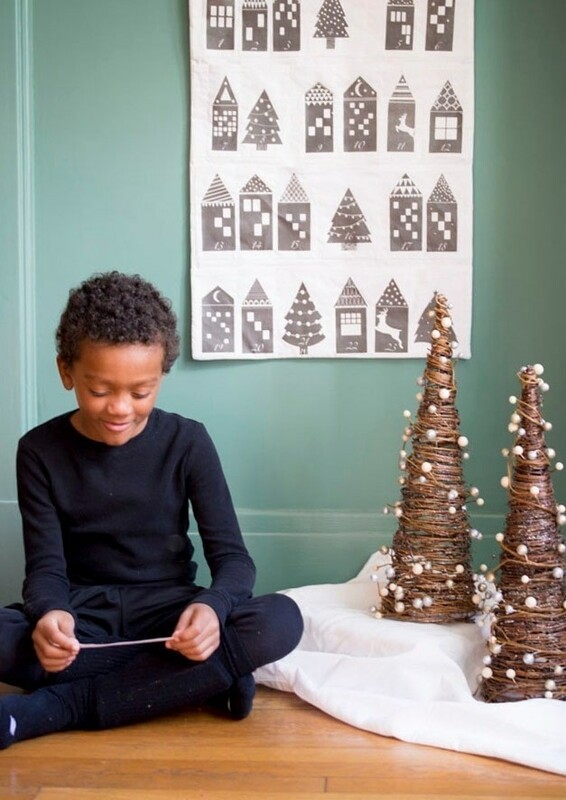 To create individual pockets for each advent day, stitch straight lines between each numbered image. Place the backing fabric on the quilt batting, aligning all edges. Baste stitch along all four sides to secure the two together. Make a casing so you can hang the banner, hem (folding 1/2″ and then 1/2″) the short sides of the casing fabric and stitch closed. Place this casing rectangle 2 1/2″ from the sides of the back portion you just prepared and 2″ from the top so it is centered. Stitch along both long sides to create a tube. Place the prepared backing fabric right-sides together with the decorated front piece (you will be looking at the quilt batting) and stitch around all four edges with a 3/8″ seam allowance leaving a 10-12″ opening at the bottom. Gently turn the whole thing right sides out, pushing out the corners and VERY CAREFULLY ironing alone the edges. Be sure you don’t iron over any of the exposed images as they will melt to the iron. Slip stitch the opening closed, using a hand sewing needle. To do so, hold each side of the opening together with one hand and slip your stitches from one side to the other. Place a yard stick or long dowel rod through the casing on the back, attach a ribbon to each end and hang it up. 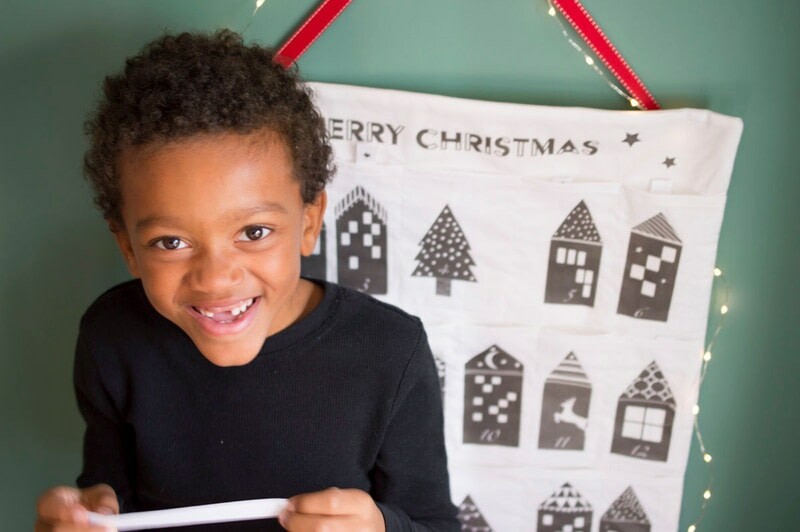 Now, you can cut up the advent activities and slip them into the pockets of your choice!